Built for faster page loading and high uptime. Studies were done by Amazon, Walmart, Google, and Akamai show how speed impacts conversions and engagement. To improve your conversion rates and customer happiness index, you need your store to perform at its best. At Nestify we make this possible with our intelligent platform that automatically optimizes the performance of your store across all devices. The absolutely best performance combined with 99.99% uptime guarantee means you can focus on growing your business without worrying about all the moving parts. Sit back, relax, and let our team handle the nitty-gritty stuff. We’ll let you know when your site’s ready to go. Need to update something in WordPress? When you need to test a new core update, a code change or payment gateway, you can use staging environments. 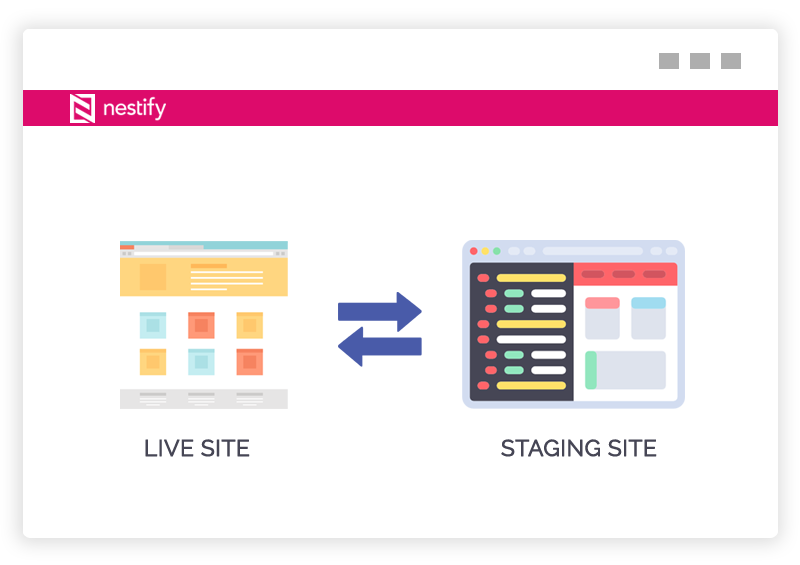 Staging environments can be created with 1 click using Nestify console. We take care of domain names, syncing files, and databases between staging and live sites. We even update the URLs inside the DB, insuring a seamless experience. When you need to push changes from staging to production, it’s a single click affair as well. Staging environments are not crawled by any search engines and can be password protected if needed. 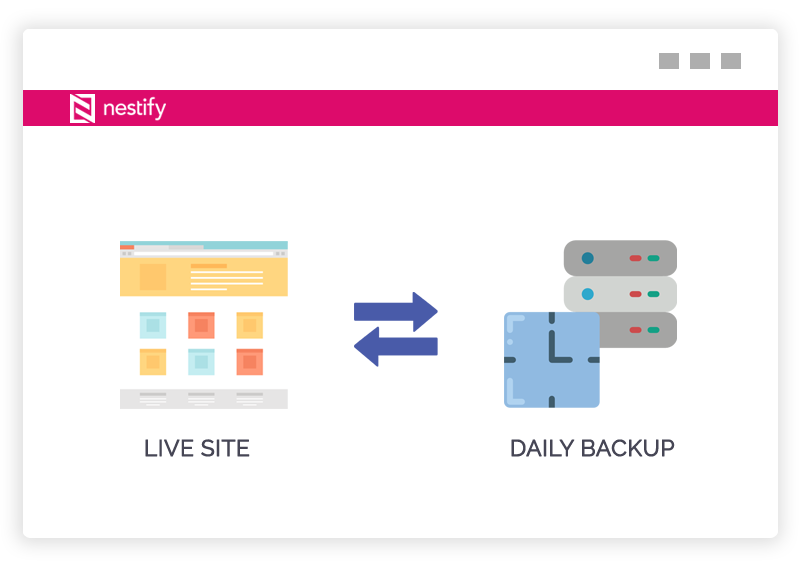 Nestify backup solution takes incremental backups of your data at least daily. Should the worst happen you’ll be able to reinstate a backup of your site with the push of a button. We offer separate backups on all environments – live and staging – so your development efforts are equally as safe. For sites where data changes more often, like eCommerce or high-volume publishers, we offer hourly backups to make sure there’s always a recent copy nearby. Find answers to some frequently asked questions about Hosting WordPress sites. WordPress is an application for developing and managing websites and blogs. It is OpenSource and dominates about 60% of the CMS (Content Manager System) market and 27.5% of the entire web. WordPress started as a project developed by Matt Mullenweg in 2003, with the goal of being a simple platform for use in web blog (or blog) sites. Due to its modular structure, its features have been extended, and today it is an efficient and winning content management system. If you’ve ever dealt with a Content Management System (CMS) you know how difficult it is to find a CMS that meets your expectations, is simple to use and works the way you want, with no fatal error messages or a bunch of bugs. Finding a CMS that is able to adapt to your needs and grow with your site, is also a very big difficulty. In our opinion, WordPress Hosting contains all these features and even more, and that’s why so many have opted for WordPress to be their CMS. OpenSource, free and with simplicity in managing content, blogs or websites in WordPress are friendly and have won the top positions in the world for its ease of use because if which most of the hosting providers now offer special WordPress hosting services to their customers. 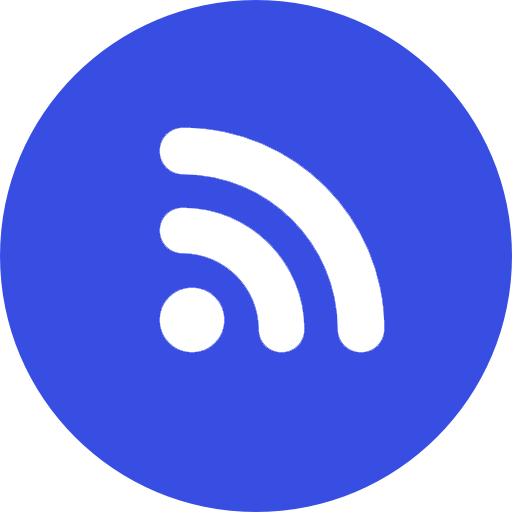 With several plugins and extensions, each blog is perfectly customizable, all to facilitate your experience as a user. Without technical terms or specific programming knowledge. Everything to bring you more advantages and less difficulty updating your content and make your website perfect for you. WordPress is free. You do not have to pay anything to use WordPress. Incidentally, the only time you need to pay is if you decide to buy managed WordPress hosting with unlimited resources and a custom theme from a company that is selling it, or if you want to hire a company to set up and manage a WordPress site for you. The user is free to use it for whatever he wants. The user is free to examine the system from the inside (the source code), study it and learn from it. The user is free to modify the system, adapt it to whatever he wants. You are free to give copies of this modified system to whomever you choose. This ensures that people around the world can study such software, such as WordPress, modify, adapt and improve them. 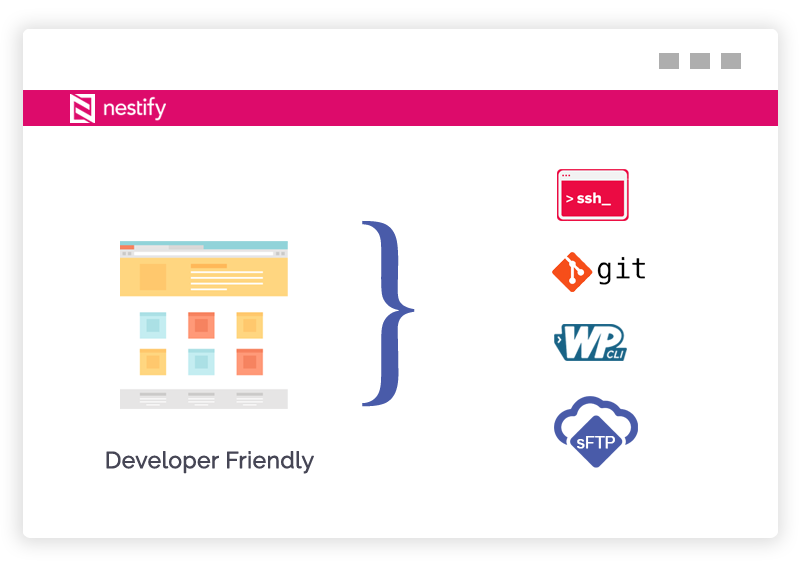 If you are not interested in studying the WordPress source code, that’s fine: This license to use ensures that you always have an up-to-date, error-free, security-free WordPress plug-in and themes available to customize your Site. Managed WordPress Hosting is a Host optimized specifically for WordPress where the web hosting company takes on many of the routine maintenance tasks. High Performance WordPress Hosting plans are already included in the installation and configuration of WordPress. This should not be confused with plans that only allow you to install WordPress, or plans that include some kind of WordPress installation script. The purpose of Managed WordPress Hosting is to simplify as many technical issues as possible on an ongoing basis and provide the fastest WordPress hosting platform. The main benefits of this technical simplification are peace of mind and time savings. Compared to shared website hosting in general Managed WordPress website Hosting offers more features at a higher price. The demand for these services can be seen in the rapid growth of many companies only from Managed WordPress Hosting. Maintenance – Automated backups, automatic upgrades. Speed optimization – cache configuration, integrated CDN services. Security – permissions settings, plugin verification, malware checking. Support – technical support integrated by dedicated WordPress experts. How can I get Managed WordPress hosting? If you want an easy-to-use, fully optimized environment with the easy one-click installation you can make good use of the managed WordPress hosting platform. 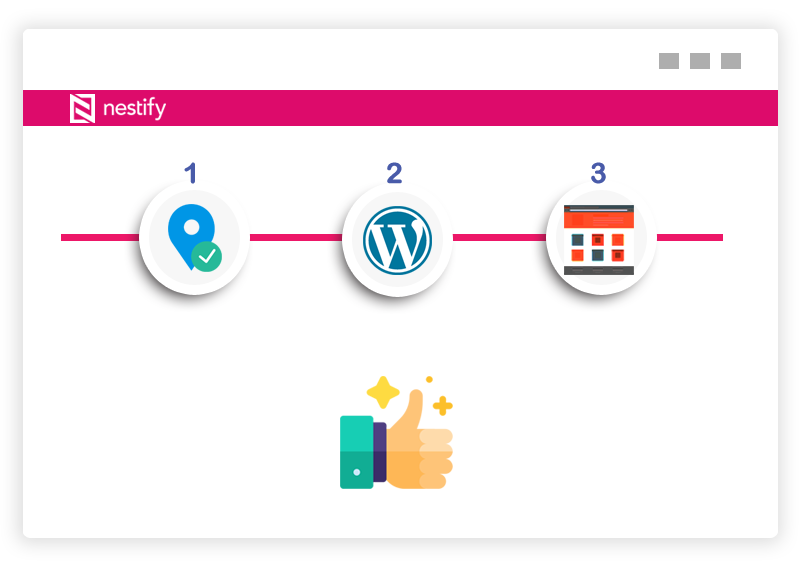 With many years of experience with WordPress, Nestify offers optimized and fully managed WordPress hosting servers for this platform and a dedicated support team to assist you from downloading to installing your plugins, turbinating your WordPress website or blog. Avoid complications and use one of the simplest management systems in the market. In many occasions, WordPress is associated with a tool that only serves to make blogs. This is not correct: with WordPress, we can make a blog and much more: business webs, online stores, digital newspaper, reservation center, etc. Below we will see some of the things we can create with this content manager. It is its best-known function. WordPress incorporates, in its default installation all the typical features of a blog: displaying articles in blog format, an option to add comments to entries, possibility to organize articles by categories or tags, etc. In addition, you can add on the web various modules, called widgets in WordPress, blogs: list of categories of the blog, a list of tags, search engine, list of articles most read, a list of last comments, etc. With all this can be said that WordPress is possibly the best tool to create a blog, with more reason if it is possible if we consider its simplicity of management. WordPress can perfectly serve to create a business web, understanding as such a page where we can inform about everything that concerns our company or business: who we are, services, clients, etc. By making use of a multitude of templates available for WordPress we can get very varied designs for our web, which could go from a website with a minimalist design and that shows little information, to complete websites that load a lot of data on each page. We can create different sections in our web to organize the contents. These are not limited to static pages or a blog page, but thanks to the thousands of plugins available for WordPress we can add more functionalities such as contact form, forum, directories, etc. Although there are other specific content managers to create online stores (PrestaShop, Magento, etc. ), WordPress can be a completely valid option, since it has several plugins that allow us to incorporate an online store on our website. Of all of them, WooCommerce would be the most recommended option, although we can choose another plugin. Using WordPress and the WooCommerce plugin we can have an online store with all the typical features that we hope to find in an application of this type: unlimited product creation, product organization by category, possibility to add attributes to products, various systems Payment, advanced order management, etc. The features of our store will not end with those that incorporate WooCommerce itself, but we can add hundreds of new options thanks to the specific plugins for it: massive import of products, postage by postal code, payment gateways with card Credit, product prices by quantity, generation of invoices, etc. As we mentioned before, there are thousands of plugins available for WordPress that will allow us to extend the possibilities of our website in WordPress, to be able to get almost anything: support forum, web reservations management, business directory, video channel, etc. If we add to the thousands of themes (templates) available, the possibilities to get any type of web are almost endless. Where do I get good WordPress themes and Plugins? In WordPress itself you can find all WordPress themes available to it, which are sorted by the users themselves, so it is very reliable to search WordPress themes by the platform itself. WordPress has a growing library of themes and plugins. In the page of WordPress plugins, we have exact 55,509 plugins available, and an unlimited number of themes to download. Understand plugins a very handy WordPress feature in which you can extend the capabilities of the CMS by adding specific elements. For example, if you want your site to have an eCommerce area, there are plugins that allow you to organize a virtual store within WordPress, with all the features necessary to achieve your goal. The themes are used to change the “face” of the site made about WordPress. 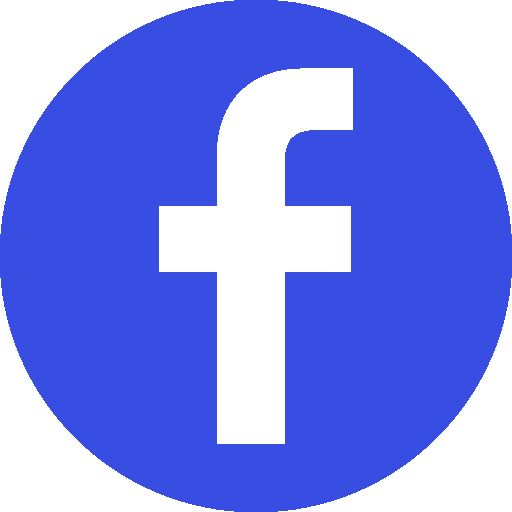 You can then customize your site by placing it in a way that is more to your liking. Even if the site does not look the way you want it, you can customize the theme, or even develop a new theme in a way that fits your purpose. Plugins and WordPress themes are very commonly used to customize your website or blog and leave with your face. You can install and use them without problems. Installation is simple and quick with few clicks. The client has to click on the Auto-installer icon on his hosting and then click on the WordPress icon after that he starts to install WordPress. Fast and without tricks.